Excellence Bovone is also seen in the choice of its partners: recently the company received the prestigious recognition of KUKA Official System Partner 2019. The partnership with Kuka, world leader in the production of industrial robots and solutions for industrial automation, is based on shared grounds of skills, high standards of engineering and attunement with the multiple needs that emerges from the various reference markets. Bovone has announced that it has recently received recognition by Kuka as the KUKA Official System Partner 2019. Excellence Bovone is also inclined in the choice of its partners: recently the company received the prestigious recognition of KUKA Official System Partner 2019. 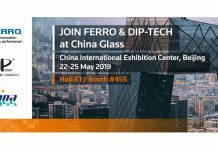 The partnership with Kuka, world leader in the production of industrial robots and solutions for industrial automation, is based on a shared ground of skills, high standards of engineering and attunement with the multiple needs that emerges from the various reference markets. 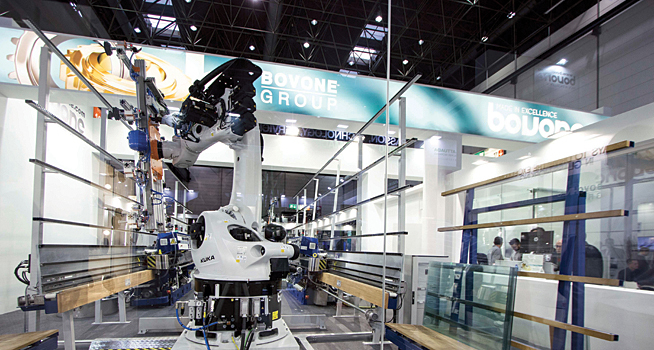 The Bovone Robotic System robotic island – BRS – integrates the Bovone glass edge processing technology with Kuka robotic automation. Belonging to the KUKA Official System Partners team (KUKA OSP Team), leads to important benefits in terms of support and software implementation with a positive repercussions in the development of the project, from the design to the testing phases: thanks to the synergies activated with Kuka, Bovone is able to give prompt and effective responses to those customers who decide to use Bovone automated solutions. The BRS – Bovone Robotic System is the ideal solution to optimize production: BRS is created using the highest levels of Industry 4.0. Robotic integration, providing a considerable increase in productivity, with reduced costs and greater safety for the operator when handling large slabs. Only Bovone is able to offer this system. Moreover, the Bovone product catalogue has been extended to meet and anticipate market demands, increasingly oriented towards automated solutions: the robots can be supplied stand-alone, applied to existing grinders or as robotic islands customized according to specific needs. The different alternative configurations share the concrete advantage of the consolidated partnership Bovonne-Kuka. For more information about Bovone: www.bovone.com.